Where Photosynthesis does takes place? How ATP and NADPH are used in Biosynthetic Phase? It is the primary source of food. It results in the release of oxygen in atmosphere. Using the similar set up used by Priestly, Jan Ingenhousz (1730 – 1799) carried out an experiment to show the importance of sunlight to plants, which somehow purifies the air fouled by breathing animals or burning candles. He took aquatic plants into observation and showed that in the presence of bright sunlight, small bubbles were formed around the green parts, while there were not bubbles during night. Later, he concluded that the bubbles were of oxygen and only the green parts are able to release oxygen. In the year 1854, Julius Von Sachs provided evidence of the production of glucose during the growth of plants. This glucose is stored as starch and later, he concluded that the green substances are located in special bodies within plant cells. He also concluded that glucose is made in the green part of the plant and is stored as Starch. T.W. Engelmann (1843 – 1909) also carried out an interesting experiment. He used prism and split the light in several components and illuminated green algae, called Cladophora, placed in the suspension of aerobic bacteria. These bacteria helped in detecting the site of evolution of oxygen. During the experiment, he observed that the bacteria accumulated mainly in the region of red and blue light of the split spectrum. This was the first time when photosynthesis was described and it resembled the absorption of spectra of chlorophyll. Where, C6H12O6 is glucose and O2 is released from water. Photosynthesis includes series of chemical reactions which are carried out in chloroplast,i.e.The specialized structures found on cells of plants. In these series of reaction, water and carbon dioxide are converted into glucose and in this reaction energy from sunlight is used. Because, it is an endothermic reaction, the entire process requires input of energy. Photosynthesis is also classified as oxidation – reduction reaction as it includes loss of electrons by water and gain of electrons by carbon dioxide. The process of photosynthesis takes place in Mesophyll Cells and the carbon dioxide required by the process enters the process via stomata, i.e. the small holes present on the outer layer of leaves. The water required for the process is transported via roots through the vascular tissues. Following figure shows the structure of Mesophyll Cells. It includes outer cell wall, cell membrane, cytoplasm, chloroplast, vacuole and nucleus. Cell Wall – It provides mechanical and structural support, determine and maintain the shape of cell, protect cells against pathogens and control the direction of growth. Cytoplasm – It is the platform of different chemical processes and is controlled by enzymes. Cell Membrane – It acts as a barrier and helps in controlling the movement of substances in and out of cell. Chloroplasts – It contains chlorophyll and green substance that absorb light energy. 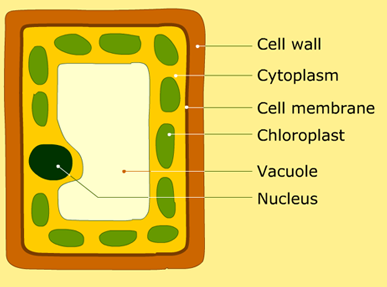 Vacuole – It holds moisture and keeps the plant turgid. Nucleus – It contains DNA and controls the activities of cell. “Pigments are the substances that possess the ability to absorb light at specific wavelength.” Leaves of plants have four types of pigments, i.e. Chlorophyll a (bright or blue green in chromatogram), Chlorophyll b (yellow green), Carotenoids (yellow to yellow – orange) and Xanthophylls (yellow). Photosynthesis takes place in red and blue regions of spectrum and some photosynthesis also takes place at other wavelengths. Chlorophyll is the major pigment that traps the light energy and other pigments are referred as accessory pigment which traps light and transfer the energy to chlorophyll a.
Photosynthetic Reactions are of two types, i.e. 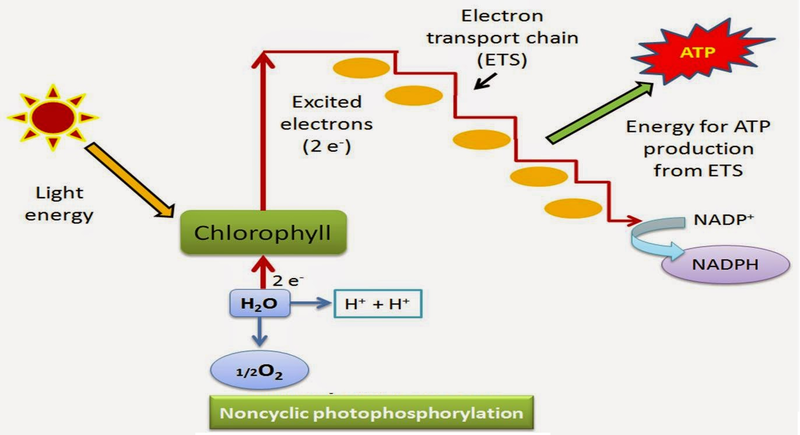 Light Dependent Reaction – In these reactions, the energy from sunlight is absorbed by chlorophyll and transformed into chemical energy in the form of ATP and NADPH (electron carrier molecule). Light Independent Reaction – This reaction is also referred as Calvin Cycle. In this reaction, the energized electron from light dependent reactions provides energy to form carbohydrates from CO2 molecules. 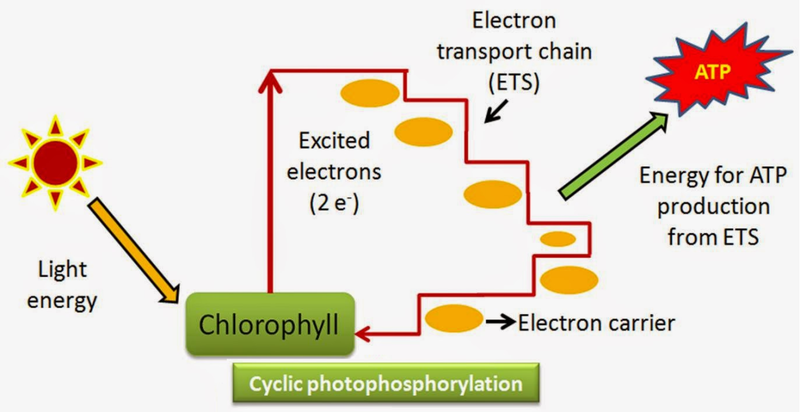 In PS II, the reaction center chlorophyll a absorbs 680 nm wavelengths of light (Refer the figure below for each step). This result the electrons to be excited and jump in an orbit. These electrons are captured by electron acceptor which passed to electron transport system of cytochromes. These electrons are not used as they pass through the entire electron transport chain but are passed onto the pigment of PS I. At the same time, electrons at PS I reaction center are also excited when they receive red light of wavelength 700 nm. These electrons are transferred to another acceptor molecule with greater redox potential. 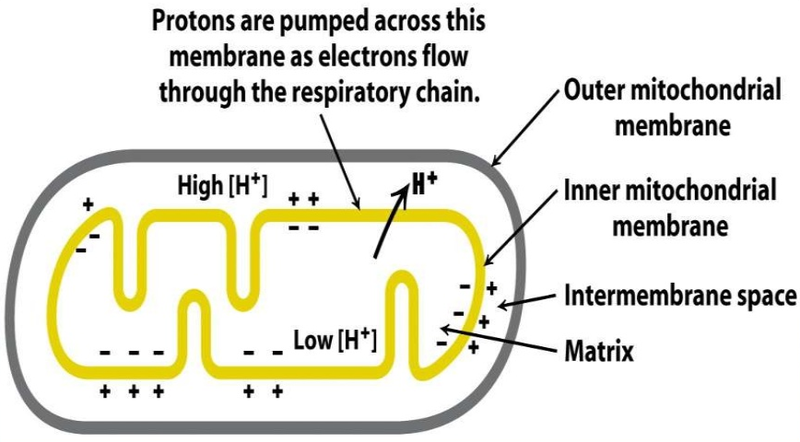 In this electron transport chain, electrons are not used rather they are passed to the pigments of b. At the same time, electrons present in reaction center of PS I also gets excited after receiving red light of wavelength 700 nm. Then, these electrons are transferred to another acceptor molecule with greater redox potential. These electrons, then move downhill and this time to energy rich molecule i.e. NADP+, whose addition reduces NADP+ to NADPH + H+. Cyanobacteria and Plants use two PS which simultaneously work to produce energy and reduce power. Primarily, a photon of light ejects a high energy light from PS II. This electron travels from excited reaction center of PS II down the chain and enters in PS I. “This electron transport system generates a proton motive force that is used to produce ATP. Since the excited electron does not return to PS II, this mechanism for making ATP is called Non – Cyclic Photophosphorylation.” When PS I absorb a photon of light, it releases high energy electron that is used to drive the formation of reducing power in the form of NADPH. This ejected electron is replaced by an electron of PS II. Peter Mitchell in the year 1961 postulated this hypothesis which explains the mechanism of synthesis of ATP during photosynthesis, in chloroplast. During light reaction or photochemical phase, ATP and NADP are generated and these are the key components used in dark reaction for production of sugar molecule. According to chemiosmotic hypothesis, ATP production is the outcome of photon gradient across the membrane of thylakoids. The essential components required in this process are proton gradient, proton pump and ATP synthase (enzyme that helps ATP synthesis). The Proton Gradient is important in this process because it is the breakdown of this gradient result in release of energy. This gradient is broken down due to the movement of proton across membrane via transmembrane channel of Fo of ATPase. This ATPase comprise of Fo and F1, whereby Fo is embedded in membrane and forms transmembrane channel and protrudes F1 on outer membrane of thylakoid membrane. We are aware of the products of light reaction, i.e. ATP, NADPH and O2. Amongst these O2 diffuses out of chloroplast and ATP and NADPH helps in driving the process leading to food synthesis and forming sugars. It is also referred as biosynthetic phase of photosynthesis and this process does not depend on the presence of light, rather it depends on the product of light reaction. It is carried out in stroma of chloroplast. We are aware of the fact that CO2 is combined with H2O to produce sugar. Scientist were very eager to find out how this reaction proceeded and just after Second World War, the use of radioisotope 14C led to the discovery that the first CO2 fixation product was 3 – Carbon Organic Acid. Melvin Calvin contributed in answering this and therefore, the complete biosynthetic pathway is named as Calvin Cycle. The first identified product was PGA, i.e. 3 – Phosphoglyeric Acid. Carboxylation – It is the fixation of CO2 in stable organic intermediate. 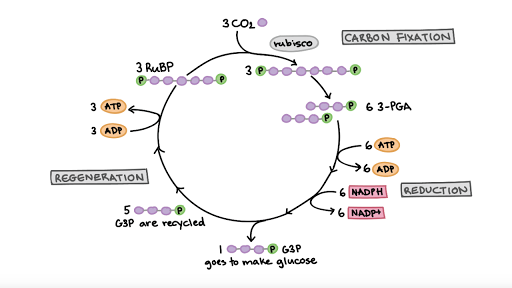 It is an important stage in Calvin Cycle where CO2 is utilized for carboxylation of RuBP in the presence of enzyme RuBP carboxylase. It results in the formation of 2 molecules of 3-PGA. RuBP carboxylase also helps in oxygenation activity and is therefore also referred as RuBP carboxylase – oxygenase (RuBisCO). Reduction – This stage includes series of reactions that result in the formation of glucose. This step utilizes 2 molecules of ATP (for phosphorylation) and two molecules of NADPH (for reduction per CO2 molecule). The fixation of 6 molecules of CO2 and 6 turns of cycle result in the removal of 1 molecule of glucose from pathway. Regeneration – This stage includes regeneration of CO2 acceptor molecule and requires 1 ATP for phosphorylation to form RuBP. Carbon Fixation – A CO2 molecule combines with 5 C acceptor molecule and RuBP. This step makes 6 Carbon compound that splits into 2 molecules of 3 Carbon compound and 3PGA. The reaction is catalyzed by RuBP carboxylase or oxygenase. Reduction – At the second stage, ATP and NADPH are converted to 3 PGA molecules into molecules of a three carbon sugar and G3P (glyceraldehyde–3–phosphate). Regeneration – At the final stage, 3GP molecules go to make glucose while other may be recycled to regenerate RuBP acceptor. The process of regeneration requires ATP along with complex network of reactions. For exiting cycle, three CO2 molecules enter the cycle for exiting 3GP molecule. This provides three new atoms of fixed carbon. Entering of 3CO2 molecules, results in regeneration of 3 molecules of RuBP acceptor. Plants that carry out C4 pathways comprise of specific enzyme that are located in two different cell types, i.e. Mesophyll Cells and Bundle – Sheath Cells. This pathway is the method that is used by plants to convert atmospheric carbon dioxide in chemical compound containing four carbons. This pathway is used by the plants in subtropical areas such as Sugar Cane, Maize, Millet, Papyrus and Sorghum. These plants are special and have several type of leaf anatomy, i.e. they can tolerate higher temperature and also show response to high light intensity. This pathway is cyclic in nature. The primary CO2 acceptor is 3-Carbon Molecule PEP (phosphoenol pyruvate) and is present in mesophyll cells. PEPcase or PEP carboxylase is the enzyme that is responsible for this fixation. It is important to note that the mesophyll cells do not have RuBisCO enzyme and C4 acid OAA is formed within cells. 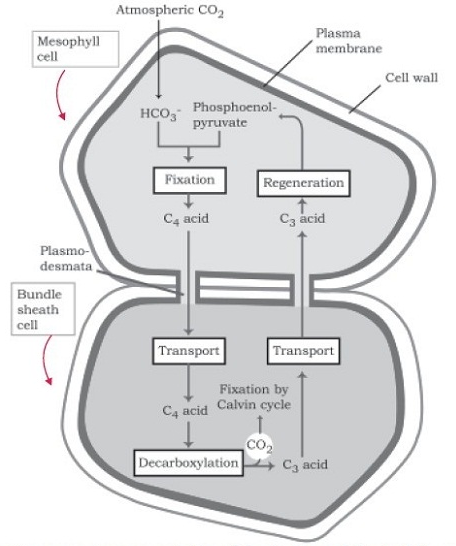 Photorespiration is a biochemical process in plants in which, especially under conditions of water stress, oxygen inhibits the Calvin cycle, the carbon fixation portion of photosynthesis. Photorespiration results in light dependent uptake of O2 and release of CO2 and is associated with metabolism and synthesis of small molecule named glycolate. This process simultaneously takes place in green plants along with photosynthesis. Its end result decreases the net amount of CO2 and both photosynthesis and photorespiration works opposite to each other. The rate of photorespiration increases at any time when the level of carbon dioxide is low and oxygen is high. Such condition occurs when stomata remain partially closed or completely closed and photosynthesis is underway. Majority of time, the stomata of plants are open, resulting in lowering down the rate of photorespiration. But when plants become water stressed, they close stomata to prevent loss of water via transpiration. Thus, on the other hand, restricts the normal exchange of gases. The level of CO2 gradually rises as water splits during light reaction. In desert and dry tropical areas, photorespiration is reduced due to water stress and this on the other hand, results in lowering down the potential of plant growth. Some plants have adapted to this problem by modifying the way they carry out photosynthesis. One of the common adaptations is called C2 Metabolism in which plants develop different leaf anatomy called Kranz Anatomy. Temperature – When carbon dioxide, light and other factors are not limiting, photosynthesis rate increases with the rise in temperature. The most preferred range of temperature is 6° C – 37° C. High temperature results in inactivation of enzymes and thereby affects enzymatically controlled dark reactions. Carbon Dioxide Concentration – It is the major limiting factor and its concentration is very low in atmosphere, i.e. 0.03 – 0.04%. Increase in concentration to 0.05% causes increase in fixation rate of CO2. Added to this, the C3 and C4 plants differently respond to the concentration of carbon dioxide. “The fact that C3 plants respond to higher CO2 concentration by showing increased rate of photosynthesis leading to higher productivity has been used for some greenhouse crops like bell pepper and tomatoes.” Such plants are allowed to grow in CO2 enriched environment that leads to higher yields. Light – The light varies as per quality, duration and intensity and has significant impact on the rate of photosynthesis. For instance, there is a linear relationship between incident light and CO2 fixation at low light intensities. Added to this, increase in the incident light beyond point causes breakdown of chlorophyll and decrease in photosynthesis. Oxygen – Oxygen inhibits photosynthesis in C3 plants but C4 plants show little effect. This is so because C4 plants carry out photorespiration and high oxygen stimulates it. The rate of photosynthesis increases with the reduction of concentration of oxygen. Water – It is an essential raw material for the assimilation of carbon. Less than one percent of absorbed water is utilized in photosynthesis. The decrease of water content in soil decreases the rate of photosynthesis as well. This is so because it results in dehydration of protoplasm and also results in stomatal closure. Added to this, it impairs enzymatic efficiency, affects its colloidal state, inhibits respiration, etc. Mineral elements – These are also essential for the growth of plants and it includes Cu, Cl, Mg, Fe, P and these are closely related with the process of photosynthesis. Air pollutants – Metallic and gaseous pollutants reduce photosynthesis. The pollutants include SO2, oxidants, ozone and hydrogen fluorides. Chemical compounds – Although, chemical compounds are present in very less quantity but even the small quantity depresses the rate of photosynthesis. On contrary, increase in the presence of chemical compound results in dying of cells. Thus, there are several factors that affect the rate of photosynthesis. Other factors include content of chlorophyll, protoplasmic factor, accumulation of carbohydrates, etc. Q1. How does PS II supply electrons continuously? Sol. PS II is able to supply electrons continuously because of splitting of water. The water is split in H+, [O] and electrons. This creates oxygen, which is the net product of photosynthesis and the electrons required to replace removed from PS I are provided by PS II. Following reaction shows the continuous supply of electrons. Q2. What is the difference between cyclic and non – cyclic photophosphorylation? It takes place in isolated chloroplast and bacterial photosynthesis. It commonly takes place in green plants. It occurs in PS I. It occurs in PS I ad PS II. It involves synthesis of ATP. It involves synthesis of NADPH2 and ATP. Photolysis of water does not occur and therefore, oxygen is not produced. Photolysis of water occurs and therefore, oxygen is liberated. Electrons move in closed circle in this process. Electrons do not move in closed circle in this process. Q3. What is the difference between C3 and C4 plants? Photosynthesis is carried out in mesophyll tissues. Photosynthesis occurs in mesophyll cells and bundle sheath cells. The CO2 acceptor is RuBisco. The CO2 acceptor is PEP carboxylase. Absence of Krantz anatomy in these plants. These plants possess Krantz anatomy. In these plants, the first stable compound formed is 3C compound which is also called as 3-Phospho Glyceric Acid (PGA). In these plants, the first stable compound formed is 4-carbon oxaloacetic acid (OAA). The optimum temperature in this category is 20 – 25 0C. The optimum temperature in this category is 35 – 44 0C. Loss of photorespiratory is high. Photorespiration does not take place. Q4. What is the difference between C3 and C4 pathways? The primary acceptor of CO2 is RuBP, a 6 carbon compound. The primary acceptor of CO2 is phosphoenol pyruvate – a 3 carbon compound. In this pathway, the first stable product is 3 – phosphoglycerate. In this pathway, the first stable product is oxaloacetic acid. It occurs in mesophyll cells. It occurs in mesophyll and bundle sheath cells. It is a slow process of carbon fixation where photorespiratory losses are high. It is the faster process of carbon fixation and photorespiratory losses are low. Q5. By looking at a plant externally can you tell whether the plant is C3 or C4? Why and how? Sol. It is not easy to distinguish between both C3 or C4 plants by just looking at it or by observing leaves. Unlike C3 plants, C4 plants too have special anatomy called Kranz Anatomy and this difference can be observed only by focusing on cellular level. 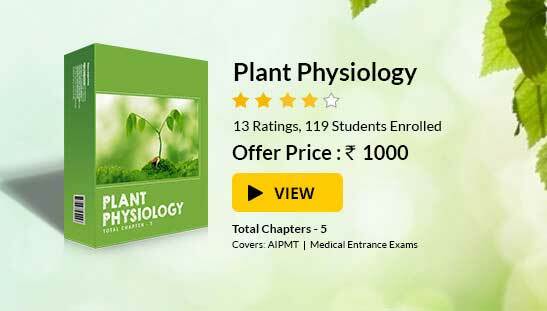 To read more, Buy study materials of Photosynthesis in Higher Plants comprising study notes, revision notes, video lectures, previous year solved questions etc. Also browse for more study materials on Biology here.